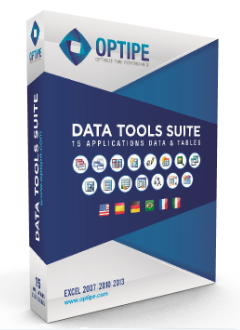 Data Tools Suite adds 15 great applications to Microsoft Excel for data and tables management, allowing you to do the work of hours in minutes and save a lot of time at work with your data in Excel. You can easily merge tables, group data from different tables, create summaries, consolidate forms, select and filter by various criteria, manipulate texts, among many other possibilities. And in a fraction of the time it normally takes you. DataToolsSuite promotes and facilitates your work as a Excel user, so you can spend most of the time in what really adds value to your business: information analysis and decision-making. Learn to use it in 20 minutes (clic here) with our selection of VideoExamples. Multilanguage: DataToolsSuite is available in English, Spanish, Portuguese, German, French and Italian. Videos and support are only available in English and Spanish. Who should use Data Tools Suite? 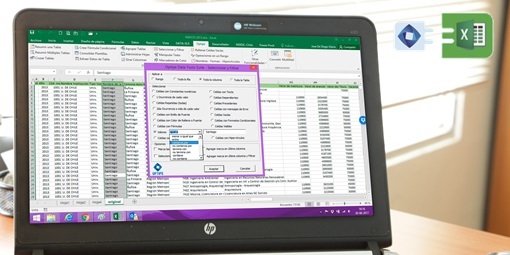 Use Excel to manage data and generate information for decision making. In their companies have organizational systems, ERP or similar, but require export data to Excel to build more developed analysis or criteria other than those provided by these systems. Perform operations on the data to prepare PivotTable as standardize texts, fill blank cells, group data from different sheets, among others. Waste valuable time performing routine tasks on the data in Excel. Generates a summary of a data table by one or multiple criteria. Allows various aggregation functions (sum, average, count, max, min). You can update the summary after generated. Generates a consolidation of templates or forms located on different sheets. Group data from multiple tables located in different sheet in a single table. Allows you to choose the tables and fields to include in the group. Select cells by various criteria. You can also filter the cells. Optionally, mark the selected cells with a color and can extend the selection to the entire row. Performs arithmetic operations simultaneously in a range of cells. Lets you add, subtract, multiply or divide by a constant, round (to integer, ten, hundred, or thousand). It also allows you to define a custom operation. Generates a summary of multiple tables located in different sheets. Create a formula to search, count or sum data conditionally based on one or more criteria. Match types: search data, search position, look if exists (yes / no), count occurrences, sum data, average, maximum, minimum. Group sheets located in different workbooks. You can hide, show, sort, protect, unprotect and rename the sheets. Also allows you to save sheets in individual files. It allows you to fill the empty cells in a range with a reference to the cell above. Also you can fill with text or numeric constants. Select all shapes or objects, names and existing hyperlinks in Excel sheet or workbook. Selected items can be removed. Allows merge data from two tables based on one or more criteria. Incorporates in the first table matching data from the second one. Extracts data from a table or database similar to a query. Allows various criteria for extraction. It also allows you to split a table in multiple sheets. Rotate or unpivot two-dimensional columns. The result table may be used as database for Pivot Tables. Change to uppercase or lowercase, remove accents, converts text formatted numbers to number, removes blanks. Also add prefixes or suffixes. Add color markings according to numerical data value ranges. The color marks are added in a new column or on the same column of data. More than 30 new calculation functions. Available in all your spreadsheets.